This was an interesting recipe. Unfortunately, I was in a hurry so didn’t have time to take photos of the different steps. Mea culpa. Next time I make it, I’ll have to come back and post more pictures. I adapted the original recipe. I’m starting to get a lot more comfortable in doing that — just replacing ingredients with ones that I like more or that are cheaper. For this particular recipe, I had bought a large batch of beef strips from Costco and had feta in the fridge already so that’s what I substituted. Skip the feta if you’re following a really strict paleo diet. Combine the pepper, 1/4 teaspoon salt, 1 1/2 teaspoons olive oil, and 1 teaspoon lemon juice in a small bowl then rub this over both sides of the meat. Coat the skillet with cooking spray. Add the meat to the pan and cook 5 minutes on each side or until it reaches your desired degree of doneness. Remove the steak from the skillet then let it rest for 5 -10 minutes. Combine remaining 1 tablespoon olive oil, 1 tablespoon lemon juice, honey, and 1/8 teaspoon salt in a large bowl and stir it well with a whisk. Add the arugula to a bowl and toss gently with the dressing to coat it. 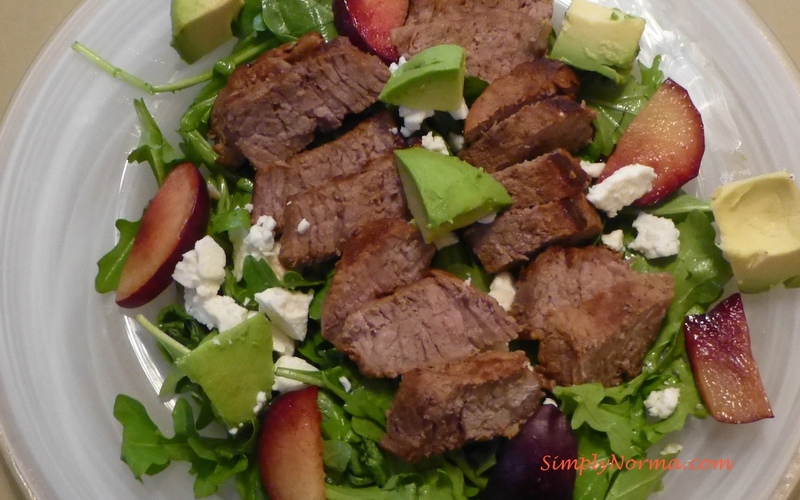 Arrange about 1 1/2 cups arugula mixture onto each of 4 plates and top each serving with 3 ounces steak, about 1/2 cup plums, sliced 1/4 avocado and 1 tablespoon of the cheese. Pretty simple, no? Here’s the final product. This recipe is similar to the Thai Steak Salad that I made before. Scrumptious!